Let’s be honest…looking for tarantulas on the ceiling before sitting down to dinner is not considered normal. Nor is checking for frogs in the shower before you shampoo. But as many of our Amazon travelers will attest, there is an undeniable sense of pride and accomplishment when you can actually say you’ve done this! There are definite benefits to traveling to places in the world that take you to the edge of your comfort zone. 10. real growth and learning happen! Take for example, the tarantula on the ceiling. When it fell from the rafters onto the dinner table, naturally a collective gasp (and a few shrieks) erupted around the room. But after the initial shock, these were replaced with awe and wonder. The student closest to the airborne arachnid overcame her phobia and calmly held her ground, much to the awe of her peers! 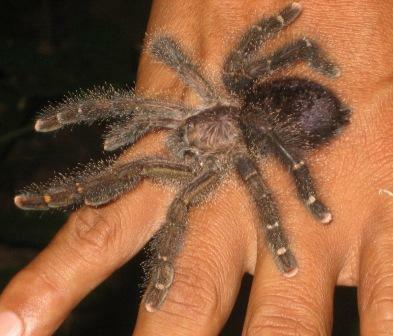 This in turn inspired others to take a closer look as researcher, Steve Madigosky, gently collected it and explained it was a pink-toed tarantula (Avicularia sp.). Sure enough it looked as if each of the eight toes had been dipped in pink nail polish, prompting oohs and ahhs instead of squeals and shrieks from the audience. Someone then asked the obvious question, “What was it doing on the ceiling?” Much to everyone’s surprise, Steve explained that there are arboreal (tree dwelling) tarantulas in the Amazon, uniquely adapted to life in the treetops. The beauty that landed on the dinner table had simply lost her footing but because she was built for tree top living, she survived the fall just fine. When was the last time you checked for tarantulas on the ceiling? If you haven’t, maybe it’s about time! ← Amazon Rainforest Floods U.S. Classrooms!